Nigeria coach Stephen Keshi says the African champions will be intent on lifting the Confederations Cup when they travel to Brazil in June. The Super Eagles beat Burkina Faso 1-0 in the Nations Cup final to qualify for the global event for the first time. 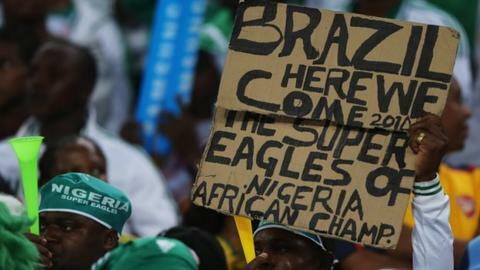 "We will go to Brazil not as tourists but as challengers for the trophy," Keshi told BBC Sport. Nigeria face Tahiti, Uruguay and Spain in Brazil, which will use the event as preparation to host the 2014 World Cup. While the West Africans - who are set to arrive back in Nigeria to a heroes' welcome on Tuesday - will compete in Group B, host nation Brazil will take on Italy, Mexico and Japan in Group A. The global event, which was founded in 1992 and is held every four years, has never been won by an African team, with Cameroon's second-place finish in 2003 the closest the continent has come. But Keshi is confident his side, who won their third Nations Cup crown in Johannesburg on Sunday, can fulfil African hopes and go all the way. "The Super Eagles will prove to the rest of the world that what happened in South Africa wasn't a fluke," added the former Nigeria captain, who won the Nations Cup as a player in 1994. "They will call us dreamers but you don't go into a tournament without the strong desire and ambition to win it. We will represent Africa and not just Nigeria." The former Mali and Togo coach also revealed that when he originally told his squad that they had every chance of competing in Brazil in June, the players were highly sceptical of their manager's predictions. "While preparing the team, I had my eyes set on Brazil," he explained. "I was confident we would get there but my players felt I was drunk or acting like a comedian - now they believe." The competition also provides striker Emmanuel Emenike with a chance to shine again on the highest stage. The joint-top scorer from the Nations Cup missed Sunday's final through injury but revealed that Keshi offered him consolation at the time with a prediction. "The coach told me I shouldn't worry about the final - that the guys would win the final - and I should wait for the Confederations Cup," he said. "I think this team is going places." Meanwhile, young defender Kenneth Omeruo - who is on loan at Dutch side Den Haag from European champions Chelsea - is thrilled by the prospect of competing against some of the world's best teams. "It's the biggest tournament that we are going to play, so I am very much looking forward to that," the 19-year-old told BBC Sport.